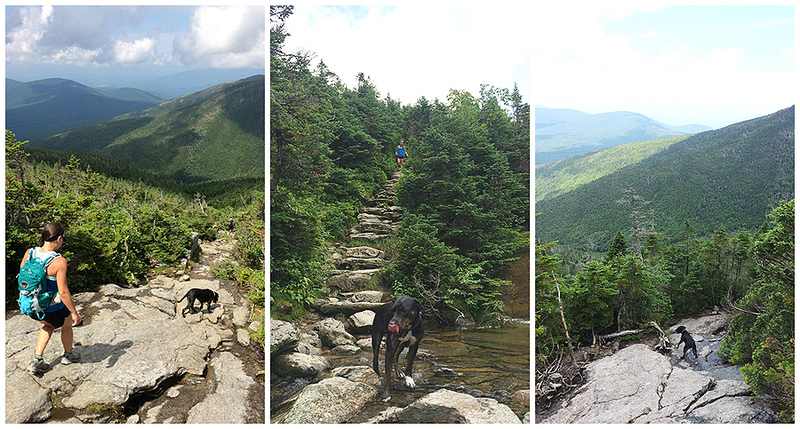 - On Monday, Whitney and I hiked Mount Washington with her friend Alice, her boyfriend, Ken, and their two year old Pittbull - Rottwieler mix, Lucy. 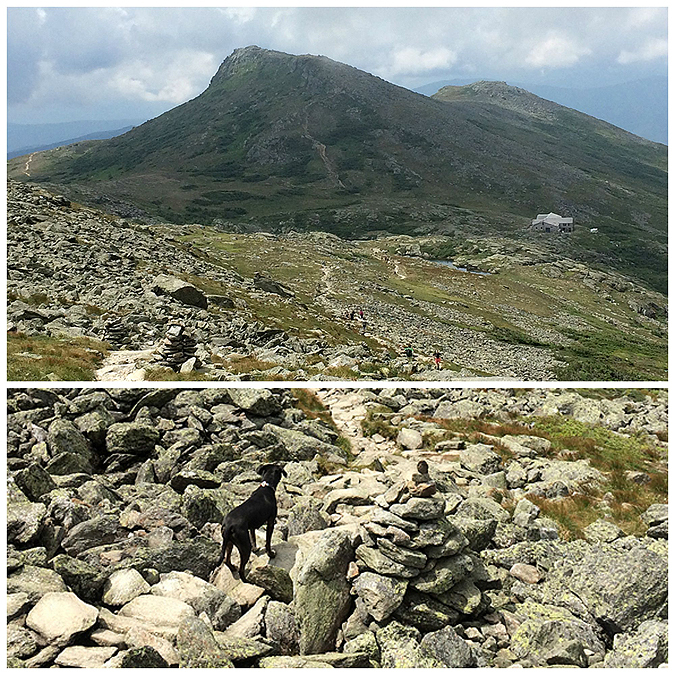 It would be the first time hiking Mount Washington for all three so we decided to head up the Jewell as it has the easiest grades and footing, and lacks the crowds that the Tuckerman Ravine and Lion Head trails have. 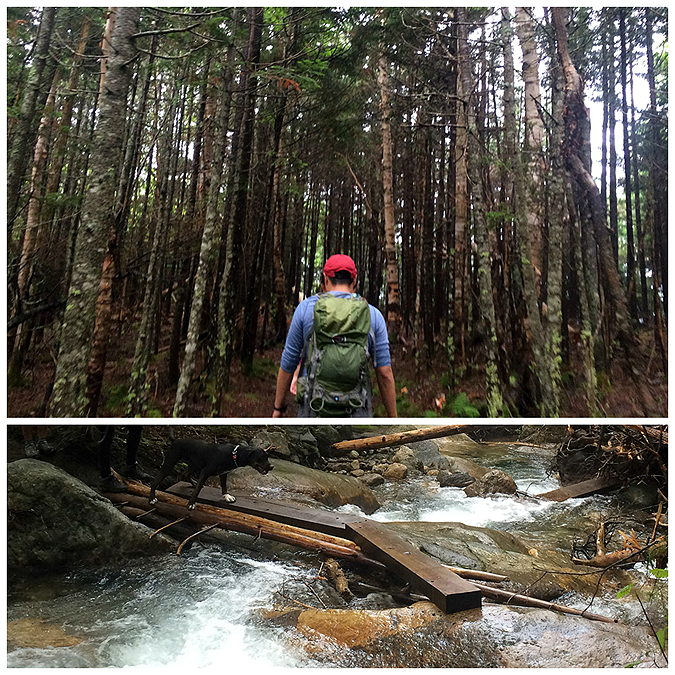 - To save some time we started our hike from Marshfield Station instead of the Ammonoosuc Ravine Trailhead. We also lucked out that we arrived to the lot before they started charging hikers for parking, score! - The ravines were all blanketed in a thick layer of fog but as we hiked they quickly blew off and we had great in and out of the clouds views for our whole hike. 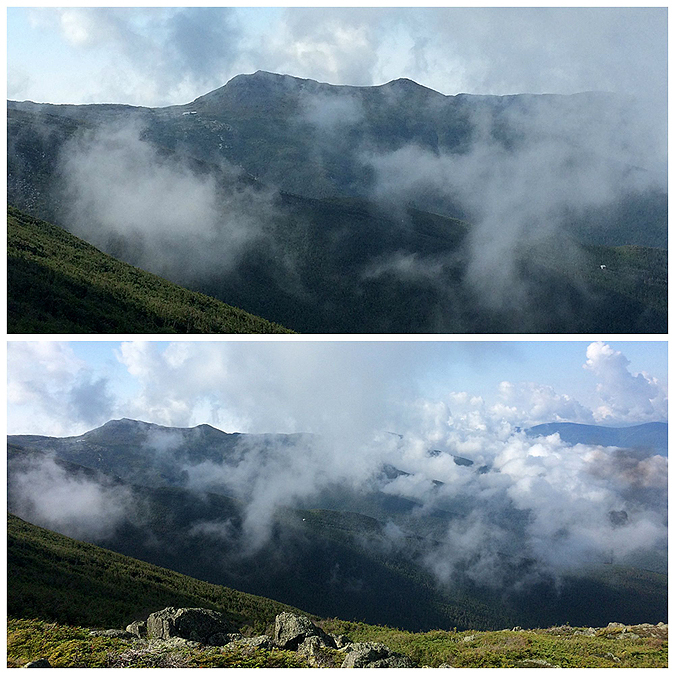 - Alice, Ken, and Lucy impressed me a lot for their first time hiking Mount Washington. Usually people take it for granted and get worn down, but they knew what it took to hike the mountain and did great. Lucy impressed me the most as she set the pace the whole day and rocked the rock pile! 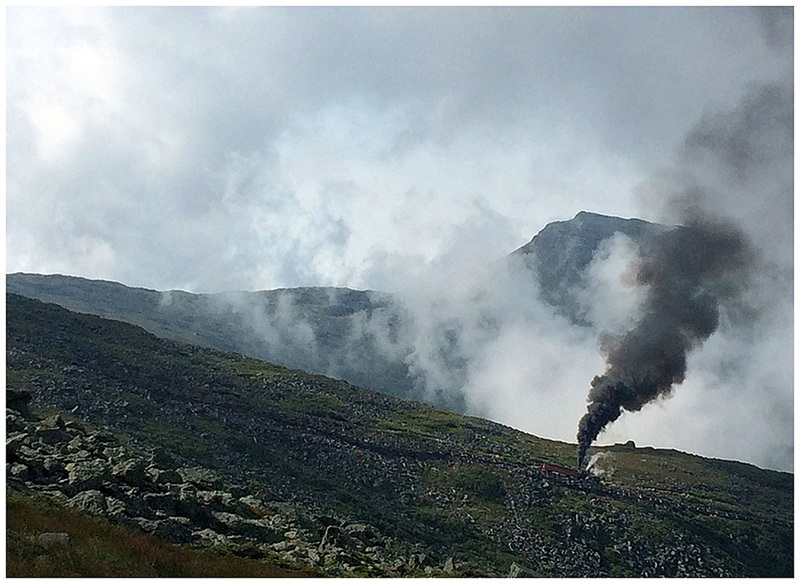 - As we broke above treeline we got to watch the first cog train head up the tracks from across Burt's Ravine. 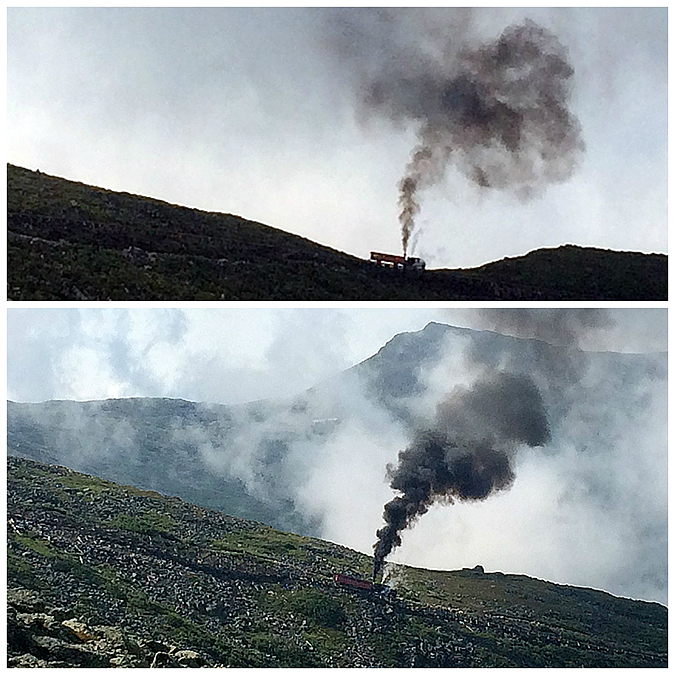 The first train that is sent up everyday is the old coal train, after that the trains that go up and down are clean burning diesel trains. I have a soft spot for the not-so-environmentally-friendly old dirty train. The whistle has a distinct sound, it train itself has a unique old sound as it crawls up the tracks, and it blows a column of smoke high up into the sky...it reminds me of my childhood riding on the train and then hiking by it every time after that when I hiked up Mount Washington via the Jewell and the Gulfside trails. 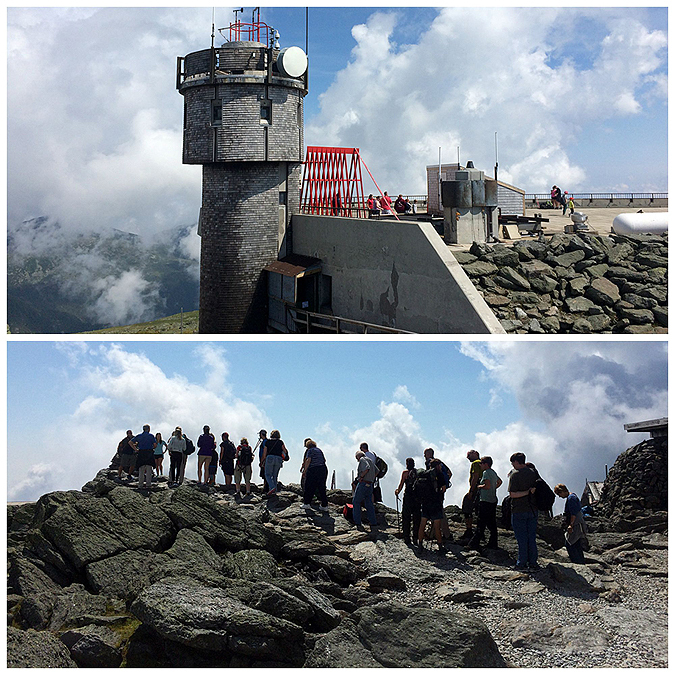 - When we reached the summit we were happy to see that it was not too crowded and there was no wind. The summit cone was in the clear while everything surrounding the cone was in a cloud, we were in the 'eye' of a school of clouds, something I never had experienced on the summit before. 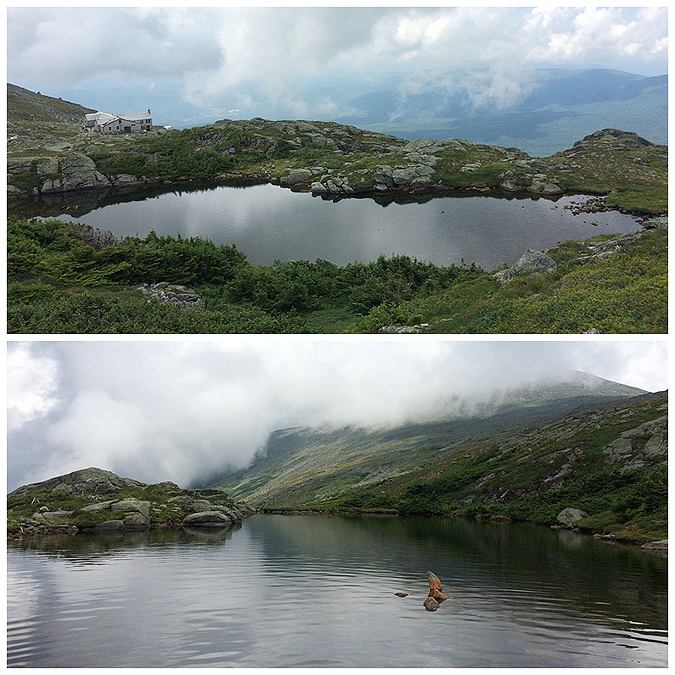 - We decided to hike down the Crawford Path to the Lakes of the Clouds Hut and then steeply descend the Ammonoosuc Ravine trail. On the hike down to the hut we went in and out of the clouds. At first Lucy didn't know what to do when the clouds came rushing in and blanketed the trail, she seemed a little unsure but after a few moments she just joyfully continued down the trail. - We took a short break in the hut where I went in and decided to check out the old log books, specifically August of 1988. Amazingly I found the book up on the shelf mixed in with about one hundred others and started to flip through the pages. When I came to the August 30th entries I stumbled upon what I was looking for, my dad's entry into the log book followed by one from my brother. At the time I was nine years old, my brother was just shy of twelve years old. 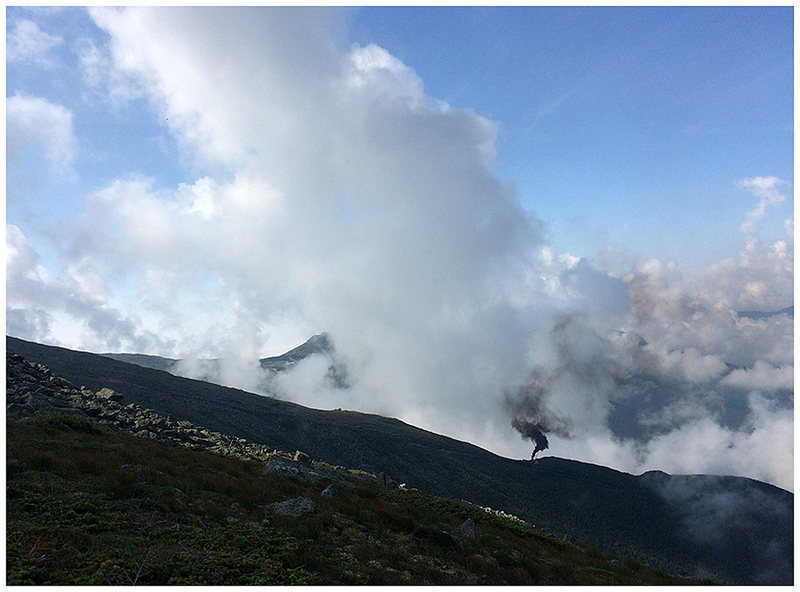 We had hiked up the Ammonoosuc Trail that morning and stayed at the hut, followed by hiking up to the summit and down the Jewell the next morning. 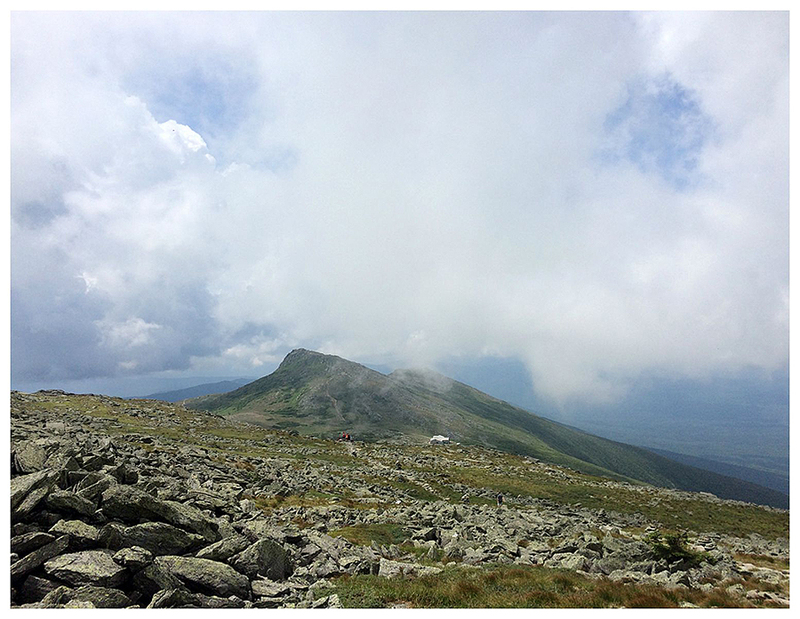 It was my first time hiking Mount Washington, almost twenty-seven years ago and forty-seven previous summit ascents before! Heading to the Jewell Trail at Marshfield Station. The original start to the trail used to be here before it was relocated down the road a half mile. There used to be a foot bridge at the water crossing next to the tracks but it got washed out this past spring (bottom). 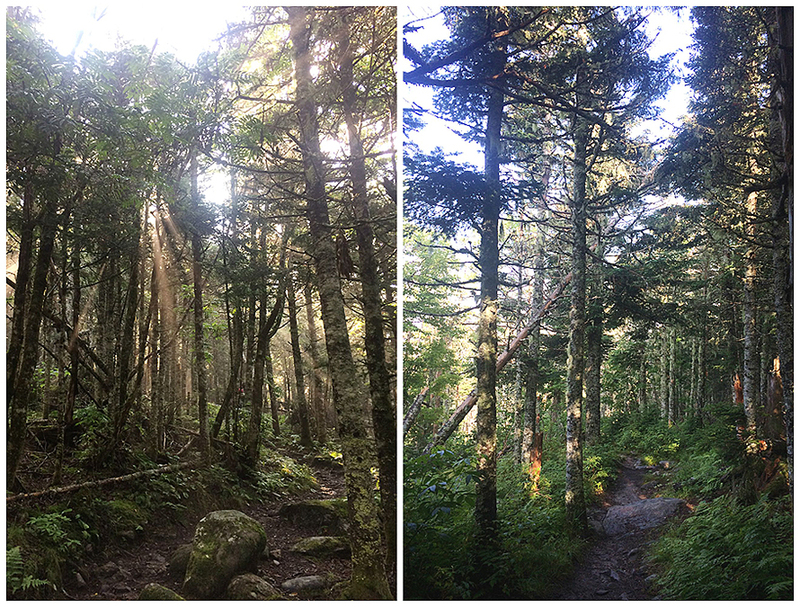 Ken heads through the narrow treed trunk forest of the Jewell Trail (top). The Jewell Trail has very good footing and moderate grades below treeline. 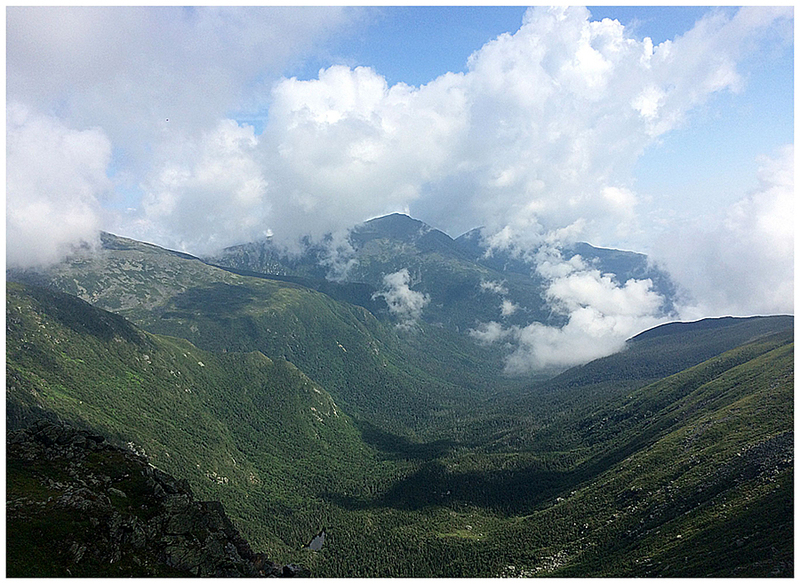 Breaking out above treeline and looking to the west as the clouds break apart. 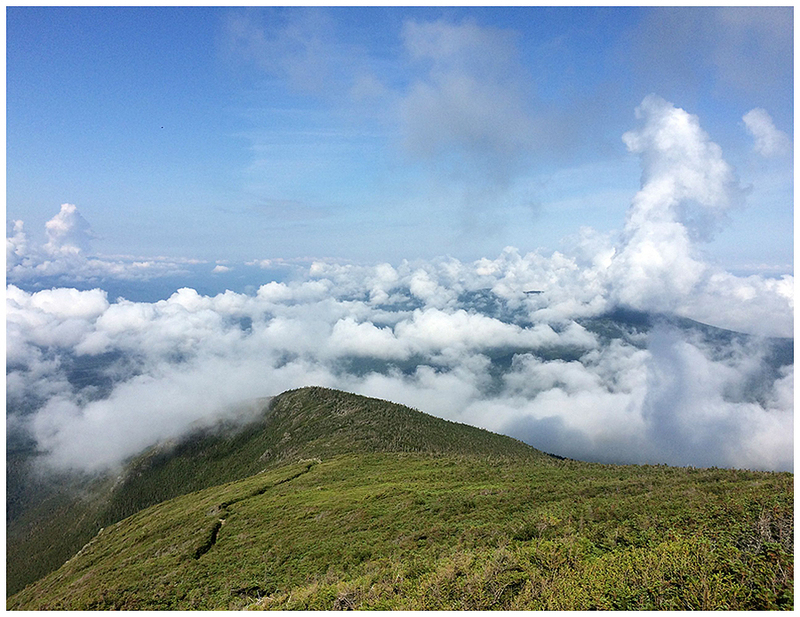 Clouds clearing off of Mount Monroe to the south. The Cog makes its first appearance. The Great Gulf Wilderness from high above on the Gulfside Trail. 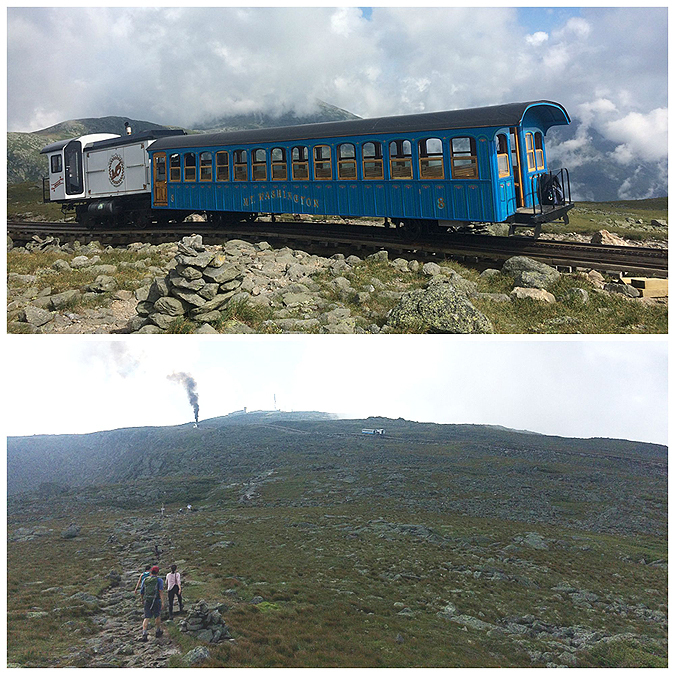 Making our way past the tracks and up to the summit. 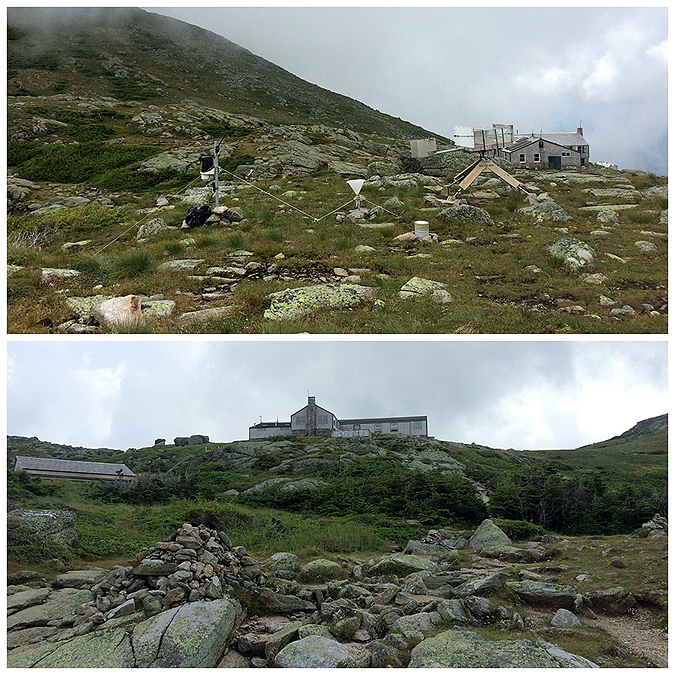 Mount Washington's summit and weather observatory. 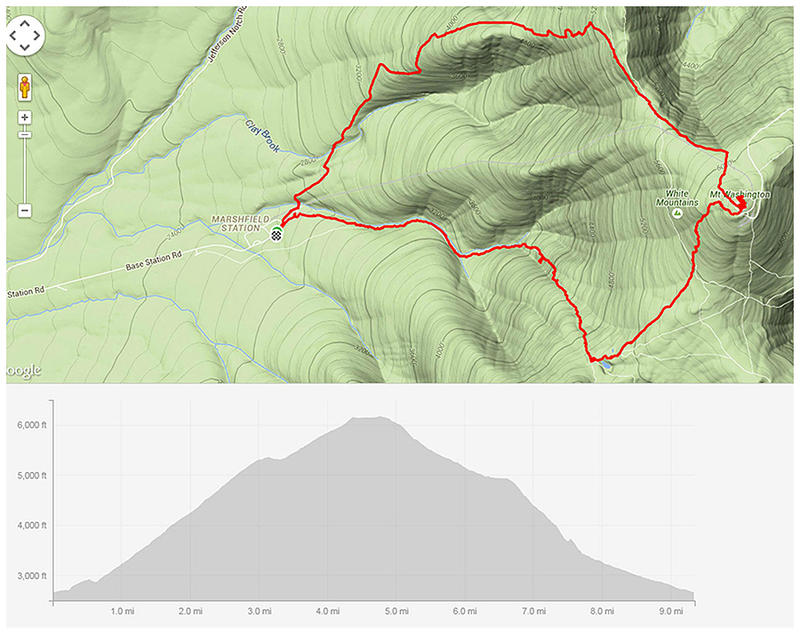 After relaxing on the summit we head down America's oldest maintained trail, the Crawford Path. Lucy heads to our next destination, Lakes of the Clouds Hut. Inside the hut I found the log book from 1988. My dad always had this thing about being the Griswold's (from National Lampoon's Family Vacation) on our trips up north. 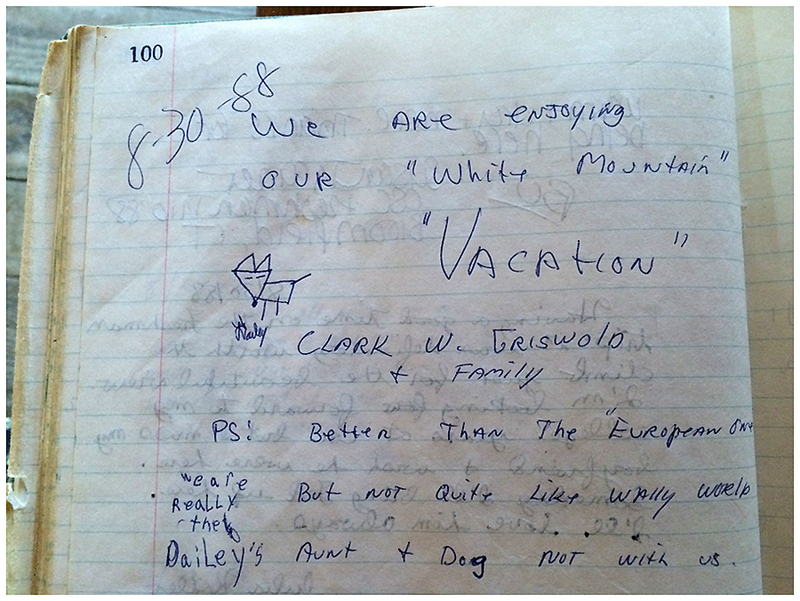 This one reads, "We are enjoying our 'White Mountain" "Vacation" Clark W. Griswold + Family. P.S. Better than the European one but not quite like Wally World. Aunt + dog not with us. 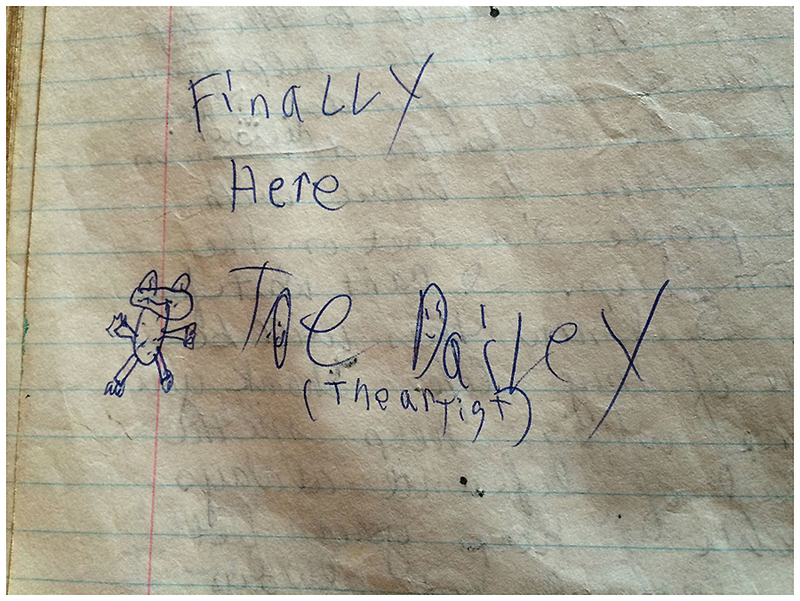 We are really the Dailey's." The aunt and dog is another reference to the movie. If you remember, they had to pick up Aunt Edna and she died in the back seat so they strapped her to the roof. They also had the dog with them, which Clark tied to the back bumper and forgot about and drove away. My brother signed the book. He loved and still loves Kermit the Frog, as you can see from the frog drawing. 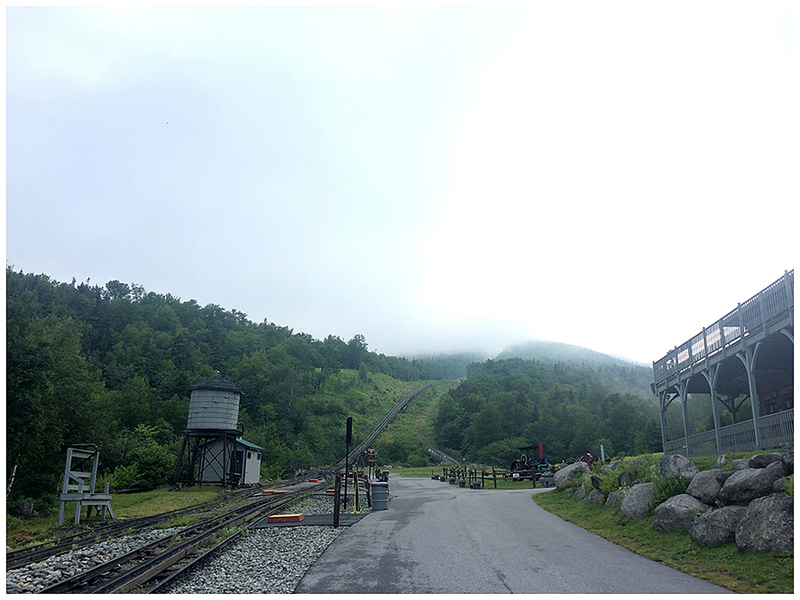 "Finally Here, Joe Dailey (the artist)"
Heading down the slab of the Ammonoosuc Ravine Trail. 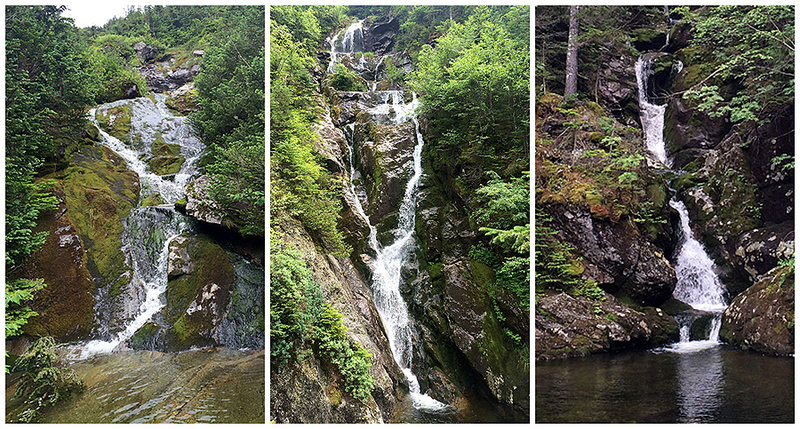 The falls of the upper ammo, the Gorge, and the Gem Pool. Wow, Chris! I love all those cloud photos! Especially the B/W contrast (smoke vs clouds)! How neat that you guys did it in this direction; so many people do Ammo first. It's fun to see that you found your entry in the log. Recently we have been to Zealand and Galehead and have seen others looking for their own history. Thanks, Beckie! We sure did have a great day hiking. Those old log books are great to look through. I have to try and find my parents signatures in all of them from here on out!